First off, I want to say that i love beef. It is delicious. I eat it often and can not imagine not eating another steak or hamburger, it’s preposterous. However, I do understand that eating too much of it can be harmful to your health and I tend to eat a lot of venison. Venison is great. It tastes awesome to me and I love to cook it. It’s always a rewarding experience to eat what you kill and have the truest form of “organic meat” in my opinion. 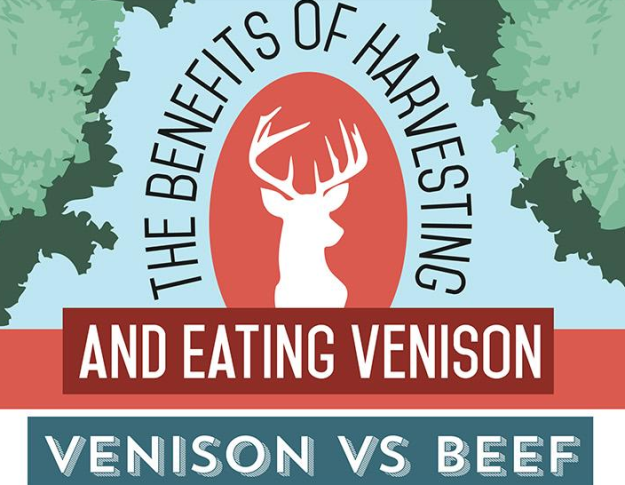 Check out this awesome info graphic created by Marin Lisica of Good Game Hunting to learn more about the benefits of eating venison vs. beef. As you can see from this graphic, venison has some serious health benefits over beef. It really is an organic meat since (hypothetically) it doesn’t have anything added to it like some farm-raised animals. While most of us hunt deer that do eat crops that have been altered and fertilized or sprayed, I still think that wild game is some of the best meat you can eat. Is Venison Good for You? A healthy mind and body is important to me. Eating lean venison not only tastes great but fills me with good memories of the hunt, which is something that I love. While we here at MorningMoss recognize that not everyone likes the taste of venison and that’s why they eat beef (which is totally ok!) there are some benefits of the wild game meat over farm raised beef cattle. Hopefully this will at least stir up some conversation and show people who may not have tried this great tasting game animal that it’s worth a shot. It’s certainly given me plenty of meals and from what I can tell so far, a healthy body to live off of and hunt another day. Check out more Hunting articles on MorningMoss and be sure to check out Good Game Hunting as well.